Seattle's Jesus Montero was involved in an altercation during short-season Everett's game at Boise on Thursday. The first baseman exchanged words with a Mariners crosschecker and reportedly had to be physically restrained while attempting to enter the stands with a bat during the argument. Montero was coaching first base, and at the end of an inning, the unidentified crosschecker yelled at him to hustle off the field, according to Boise official scorer Liza Safford. Montero then headed to the AquaSox dugout on the third-base side. According to a game offical, the crosschecker then ordered an ice cream sandwich and had it sent to Montero in the dugout, escalating the confrontation further. The official said Montero -- who arrived at Mariners Spring Training 40 pounds overweight this season -- approached the stands with a bat while screaming profanities and threw the sandwich at the crosschecker. Montero had to be pulled back from the stands by Everett pitching coach Nasusel Cabrera, Safford said. Crosscheckers are intermediate-level scouts who verify the reports of regional scouts and pass on recommendations to their teams' scouting directors. Montero was not ejected from the game and remained in the AquaSox dugout until it was completed, the game official confirmed. Mariners general manager Jack Zduriencik told the Seattle Times late Thursday night, "I am aware of the incident in Boise. We are currently in the process of gathering information, but until I have all the details, I cannot comment." Montero arrived in Boise to join the AquaSox on a rehab assignment beginning this week. The catcher was slated to be added to Everett's roster on Friday and took batting practice with the club prior to Thursday's game. Because Minor League teams have much smaller coaching staffs than their big league counterparts, it is common for players to serve as first-base coaches. 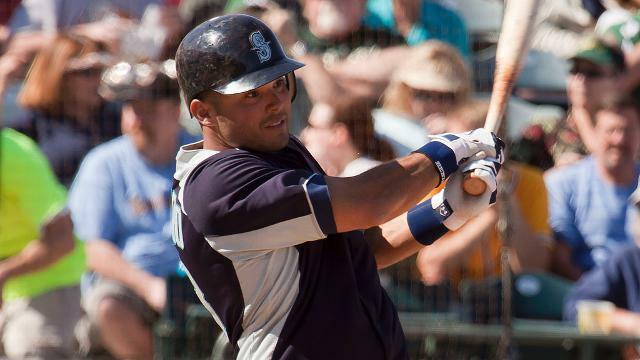 Acquired from the Yankees in a January 2012 trade, Montero is rehabbing with Everett from a strained oblique. In 97 games with Triple-A Tacoma this season, the 24-year-old has batted .286/.350/.489 with 16 home runs and 74 RBIs. He also has seen action in six big league games with the Mariners, batting .235/.235/.412 with one home run and two RBIs. Everett won the game, 13-8.